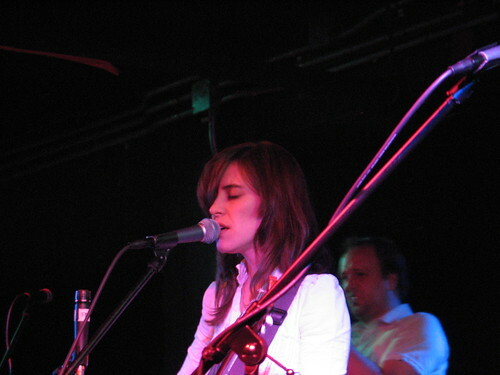 1) Feist last night at Black Cat, amazing; think I'll be listening to more Jason Collett now too. (DCist described the crowd as "a mix of hipsters and um...people that don't go to many concerts.") Glad we arrived a little early, sounds like some people missed JC because of the huge line, which we stood in for awhile even having arrived 15 minutes before the 8:30pm opening doors. 3) Death Cab for Cutie and Franz Ferdinand, April 11th, pre-sale starting next week. Get your world time clock and internet connection fired up for the pre-sale 1pm time, these are tix are going to go fast. 4) Didn't go last week when some people from work checked out Science Club but Gridskipper gives it a thumbs up...Now if only I could find a place in this town w/ $1.50 cans of PBR, anyone know of a place?